"Doing his homework and being himself on the air have been the secrets to Curt's success over the years. He is one of the great professionals of our field." 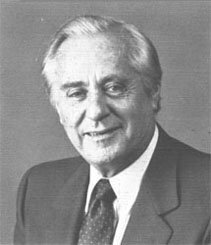 Curt Gowdy is, to borrow a line from the script of his broadcasting career, the true American Sportsman. In his forty years as a sports broadcaster, Curt has covered almost every major sporting event, including 16 World Series, 12 Rose Bowls, 7 Olympic Games, and 8 Super Bowls. His awards are just as impressive: the first Peabody award for outstanding journalistic achievement ever given to a sports figure, four Emmys, and induction into the media wing of the Baseball Hall of Fame. During his twenty years as a broadcaster for ABC's award-winning "American Sportsman", and his fifteen years as the team announcer for the Boston Red Sox, Gowdy's distinctive voice, professionalism, and personal warmth have won him fans and friends throughout the country.